Welcome to an event to raise $ and awareness for Alzheimer's. 4 days of solid rain. 3 days of hard head winds. 60 peanut butter & jelly sandwiches. Info: The largest national voluntary health organization supporting Alzheimer's research and care. Coast to Coast in 69 days! Donations are still being collected (any little bit helps). Donations go directly to the Alzheimer's Assoc. and are used for researching the disease. The address is below. 05/28/2004 Well, whats new? Its the summer again and I can't stop trying to plan another Touring trip. It looks like the Pacific Coast tour is going to be it. Expect this site to get revamped in the next month or two so that it can host more rides. Have a fun and safe summer! 10/20/2003 Launched NEW picture page. Check it out. Added information about each picture. 286 pics in all. 08/29/2003 Made it to the Pacific Coast! 69 days! Hello! My name is Andrew Brown. I'm 22 years old and in May I graduated from college at the University of Vermont. On June 21st, I began biking across the country in an event I call Coast to Coast: A Ride to Remember. 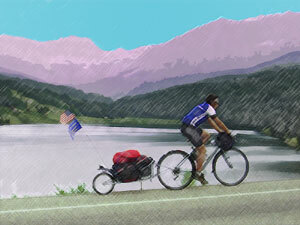 The purpose of the ride was to raise money for Alzheimer’s research and to increase awareness for the disease. I have teamed up with the Alzheimer's Association to organize this event and put the money I raise to great use.